Hawé, my name is Darian Lookout. My parents are Sammy Lookout and Suzanne Kaczmarek. I am the Granddaughter of Herman Lookout and Judith Lookout and Rose Mary Shaw. I am from the Wa-Xa-O-Li District. I am currently a sophomore at Rogers State University. I first learned how to do ribbon work and beadwork from my grandma Judy back when I was 15 and my Aunt Armeda Lookout taught her. I picked up a few things from a class in high school from Mr. Hawzipta at Pawhuska High School about peyote stitch for beadwork. I started finger weaving when I was 12 and I stuck with a beginner pattern for a little while until my grandma Rosemary Shaw gave me an unfinished belt and told me if I could finish it that I could have it. I did what I could until I got to the boarders and then went back to classes to learn the zig zag pattern. Addie Hudgins was the one who then taught me the chevron and arrow patterns. Lastly, I learned how to make shirts from my Aunt Cherie Lookout when I was about 15 or 16. Shirt making classes in Hominy will begin March 6 from 6 pm to 8 pm at the Education Building, 102 Buffalo Avenue, Hominy, OK 74035. Finger weaving classes are in progress and will continue through March in Pawhuska from 6 pm to 8 pm at the Heritage Center. 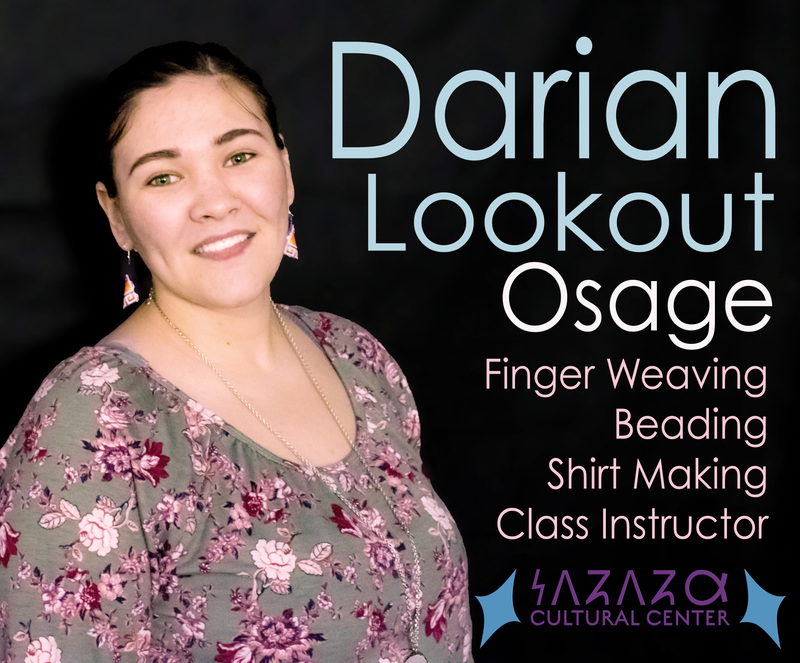 Beadwork classes will be in Pawhuska at the Heritage Center starting April 2, from 6 pm to 8 pm, every Friday until April 30. Ribbon work classes will begin May 7, from 6 pm to 8 pm, every Monday until the May 28. Hawé, my name is Vanessa Rose Moore. I am from the Osage, Pawnee, and Blackfeet nations. I grew up in Hominy, Okla. I am the daughter of Michael Moore, from Pawnee, Okla., and Hazel Moore from Hominy. My paternal grandparents are Wilson and Virginia Moore of Pawnee and my maternal grandparents are Edward Pratt and Freda Kipp Bigheart of Hominy. I am from the Zonzoli District. I learned how to weave from Anita Lookout West and Addie Hudgins by taking classes hosted by the Cultural Center beginning when I was in junior high and continuing through my high school years. I continued to finger weave on my own through college and have made many wonderful items for men, women and children. In December 2017, I graduated from Northeastern State University in Tahlequah, Okla., where I obtained my Bachelor’s degree in Art (Studio Art 2D Emphasis) with a minor in Psychology. Soon after graduation I started an internship at the Gilcrease Museum in Tulsa, Okla. I was only there a short time when I was recruited by the Osage Nation Office of the Chiefs to begin working as the Assistant Graphic Designer for the Osage Nation. Finger weaving classes are in progress and hosted at the Education Department in Hominy every Tuesday evening at 6pm. The Education Department is located at 102 Buffalo Avenue, Hominy, OK 74035. Hawé, my name is John Levi HorseChief (Osage, Pawnee, Blackfeet, Pottawatomi). 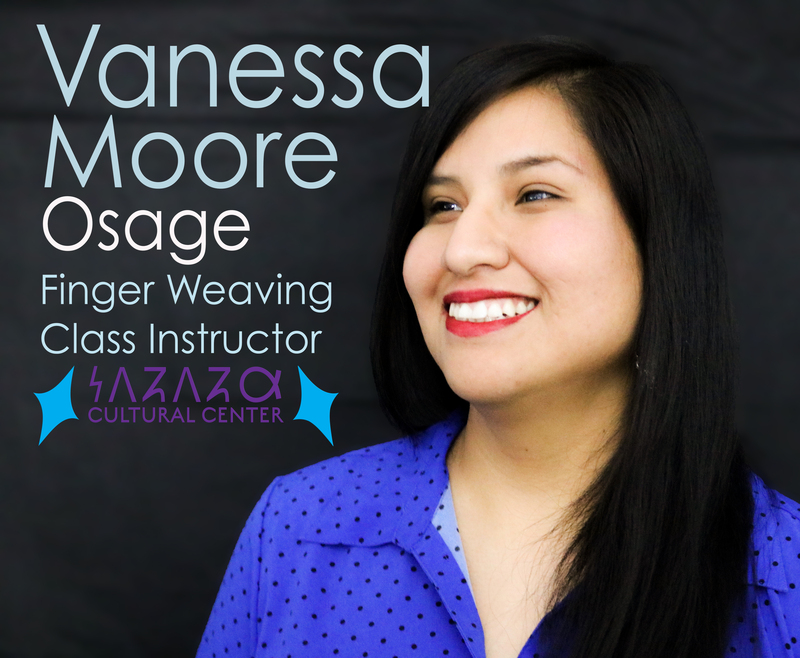 I teach moccasin making and I am the audio/visual technician at the WahZhaZhe Cultural Center in Pawhuska, Okla. I am named after John Levi the professional football player for the Hominy Indians, whom my great-grandfather George Kipp played alongside when the Hominy Indians beat the New York Giants in 1927 for the World Championship. I am the proud father of six children, three boys and three girls. My father is Alfred Horsechief Jr. (Osage) of Pawnee, Okla., and my mother is Deborah Yates (Osage) of Nelagony, Okla. I pursued my higher education in Albuquerque, NM, at the Southwestern Indian Polytechnic Institute (SIPI) and obtained an A.A.S. in Network Management in addition to becoming a Cisco Certified Network Associate (CCNA). The acclaimed Osage artist, Joe Don Brave taught me how to make moccasins. More importantly, he showed me how to encourage a relaxed, fun, artistic environment for my classrooms. I particularly enjoy working with elders. My co-workers and myself teach moccasin making during the spring and fall in Pawhuska, Hominy, and Fairfax. We also occasionally do moccasin-making workshops at other locations across the U.S. when invited. When I wear my moccasins I feel connected to the earth and my ancestors. If you are interested in learning how to make or repair moccasins, don’t hesitate and sign-up for one of the classes offered by the Wahzhazhe Cultural Center. 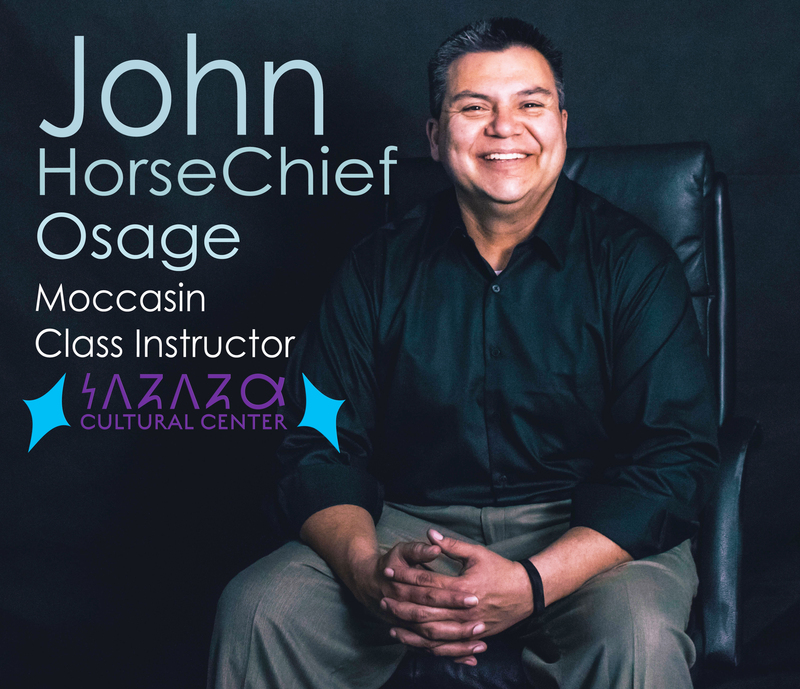 Moccasin making class is from 6pm to 8pm in Hominy on Tuesdays, March 6 and March 13. Fairfax moccasin class will begin Tuesday, March 20, and continue every Tuesday from 6pm to 8pm and will last four (4) classes. Pawhuska classes are over until the fall.